“It comes as no surprise to learn that Thailand has the third highest road accident fatality rate in the world. It is 38.1 deaths per 100,000 people. Now, according to the World Health Organisation, Thailand is not third, but second!! In the world league of road deaths. In the entire known world, only Libya has a higher death rate. The WHO tells us that 26% of all road deaths in Thailand can be attributed to alcohol, and as for seat belts, only 58% of drivers and 54% of front seat passengers use one. Even worse, the helmet-wearing rate for motorcycles is only 20% for passengers and 52% for the drivers. And in this horrifically accident-prone country, Phuket is officially the most dangerous province. 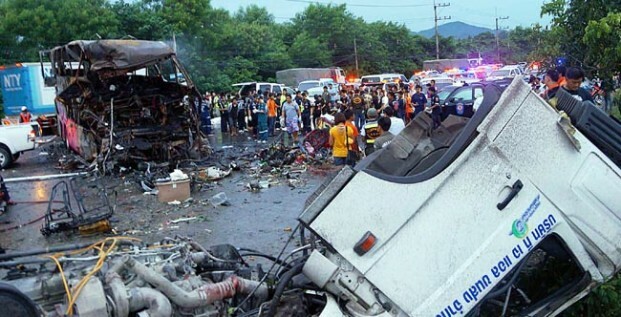 Phuket has the highest record of traffic accident reports in Thailand, with the number of people injured in traffic accidents at 4,953 per 100,000 and the death toll in Phuket is 72.04 per 100,000. 30.63 % of these deaths and injuries are from alcohol-related accidents. And here’s silly me thinking that Pattaya was the worst. All we ever get from successive Thai governments, whether elected or appointed, is the setting up of hundreds of roadblocks on high days and holidays which are manned by corrupt cops. Such measures have nothing to do with saving lives but everything to do with replenishing the coffers the poor, impoverished, misunderstood cops. Those road users who can pay the going rate are allowed to proceed on their drunken journeys. Until someone high up gets really serious about this appalling problem, and not just pay lip service to it, then nothing will change. I have no doubt that sometime soon; Thailand will top the world list of deaths on the roads. Then we can all be really proud of our Tainted Paradise. Let’s forget about all that depressing stuff about death on the roads. Here’s something world-beating and cheerful. 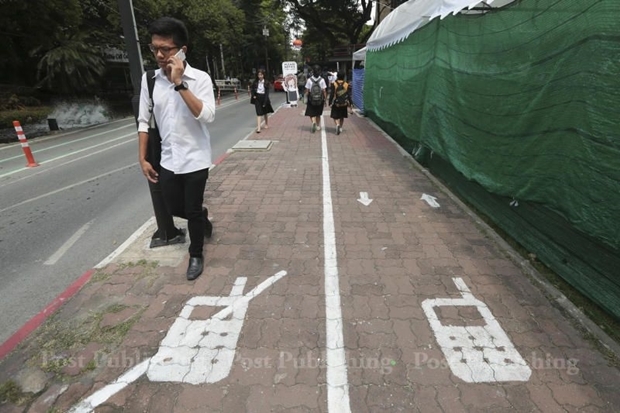 Thailand has just become the first country in the world to introduce ‘mobile phone walking lanes’ on its pavements and sidewalks. 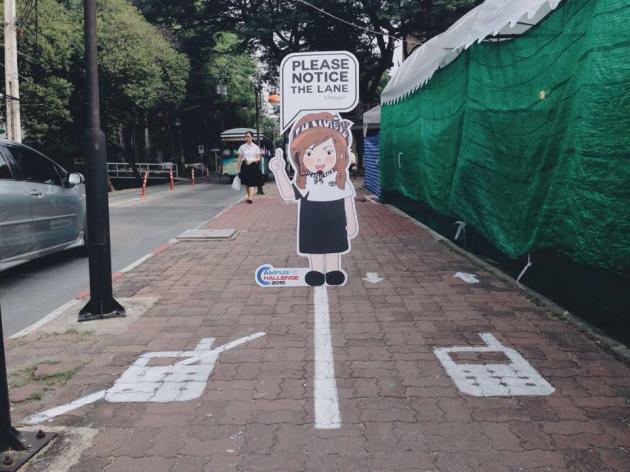 The plan is being trialled at Bangkok’s Kasetsart University to accommodate students who are fed up with bumping into smartphone users on their way to class. The 500-metre footpath has been divided into two lanes to separate phone users from non-users. During the morning ‘rush hour’, we are told that many students who are hurrying to attend classes on time find their way blocked by smart-phone users who text talk and browse on their mobiles. A few weeks back, vocational schools in Bangkok and the surrounding area decided to ban children with tattoos or stretched pierced ears in the 2016 academic year. This was in an apparent bid to improve discipline among students. The college governors stated that they wouldn’t admit children with tattoos or large pierced ears in the 2016 academic year, because such people are prone to committing anti-social behaviour and violence. As you can imagine, even in a country like Thailand where all university students are required to wear uniforms – even in their twenties- there was a hue and cry about this draconian measure. The government decided to intervene and the colleges were asked by the Education Ministry to reconsider their decision. The permanent secretary added that he didn’t think all students who have tattoos or pierced ears are hooligans or bad people. Piercing ears or tattoos are merely some symbols of the youths, he added, and in any event, the ban affects students’ rights to receive an education. Personally, I’m not against small, creative, discrete tattoos, but young people these days tend to go overboard and end up with badly disfigured bodies. I am quite sure that many of these tattoo addicts will bitterly regret what they did in later life. So maybe these vocational school administrators are saving the students from themselves…. 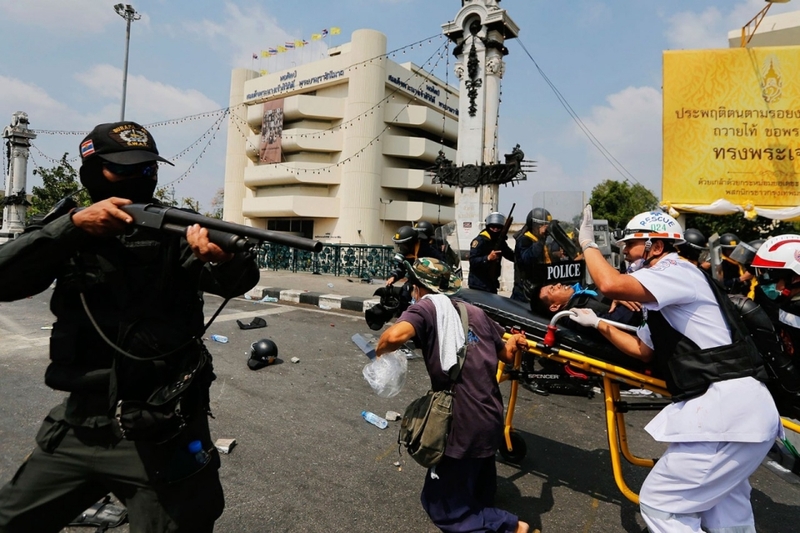 An online database of global gun statistics run by the University of Sydney’s School of Public Health, states that that Thailand has one of the highest gun homicide rates in Asia. It estimates a rate of 3.48 murders per 100,000 people in Thailand, which is three times the rate of neighbouring Cambodia and on a par with the United States!! 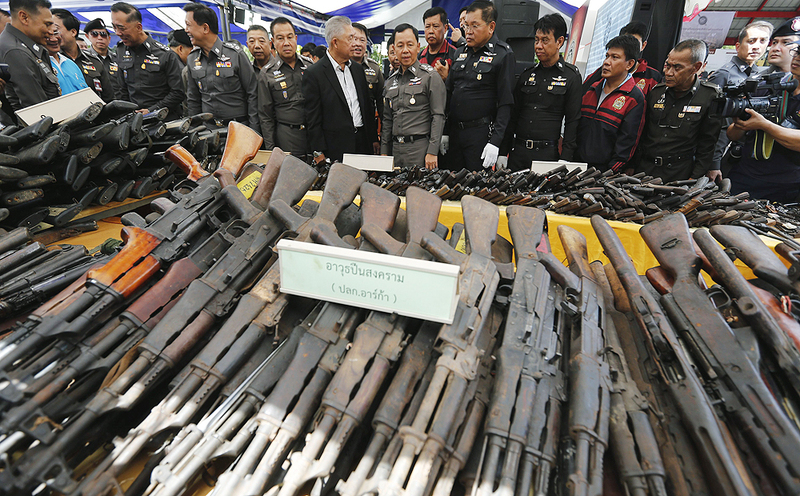 According to the Interior Ministry, there are 6.1 million registered firearms in Thailand, a country of 67 million people. GunPolicy.org puts the total number of firearms at closer to 10 million, once the thriving black market gun trade is included. 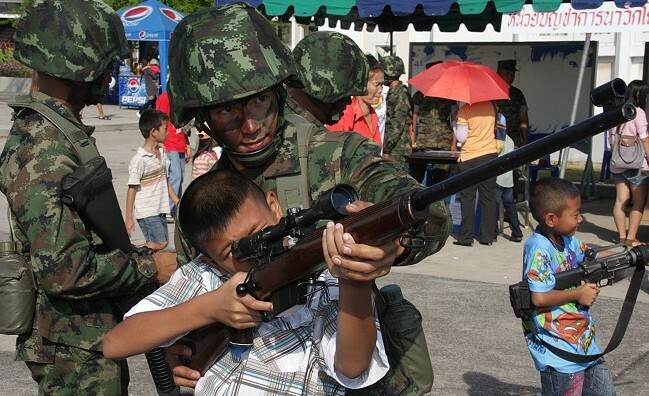 Ironically, from the ‘The Land of guns’ – we learn that the US State Department’s Bureau for Diplomatic Security has stated that Thailand has a fervent gun culture – on par with the United States -and has become a world leader in firearms-related homicides. At least in the US, there are a great many people fighting for stricter laws on gun control, including Obama and Clinton, but here in Thailand, the human toll of its firearms obsession is greeted with a collective shrug. Thailand is renowned for its laid-back, welcoming attitude, but in reality, The Land of Smiles is also a country that is awash with firearms, where disputes are often settled with a ‘bullet and a body’. Barely a week goes when a new headline-grabbing killing occurs – often more than one. These random killings usually stem from a humiliation – or ‘loss of face’ – over a personal or business dispute. Here’s just a small sample of a few recent shootings. In the resort island of Koh Samui, an influential local businessman was shot and killed in a restaurant when six bullets were fired into his body at close range by two assassins. The killers calmly unloaded their pistols in broad daylight. Holidaymakers were forced to dive for cover. The police say the killing was over a commercial dispute. A woman was shot in the neck by an angry lover in a shopping mall. A man was gunned down outside his Bangkok apartment block after arguing with a security guard. A bus driver shot a passenger in the chest because his victim had repeatedly criticised his road skills. In Chon Buri, a man shot and killed his girlfriend and her mother at a car modification shop just 20 days before they were due to be married. The man, who was known to carry a gun, shot them in an argument. He was seen on CCTV talking quite calmly with them before suddenly standing up and emptying three bullets into each of them in turn. He then danced a jig. 200 police commandos launched on a dawn raid in Uthai Thani, a central province renowned for its crime syndicates. Their target was two suspects in a 2011 gun murder in which a policeman was killed. The officers took no chances, arming themselves with assault rifles, shotguns and body armour. But by the time the convoy reached a series of mansions on the outskirts of town there was no sign of the main suspects – although 20 guns, ammunition and bullet-proof vests were seized. The killers are still on the loose, ready to be hired again for a hit. No matter it whether it be Thailand or the USA, the uncontrolled ownership of guns means out of control gun deaths. It’s as simple as that. In Thailand nobody cares, and in the USA, the NRA rules supreme.